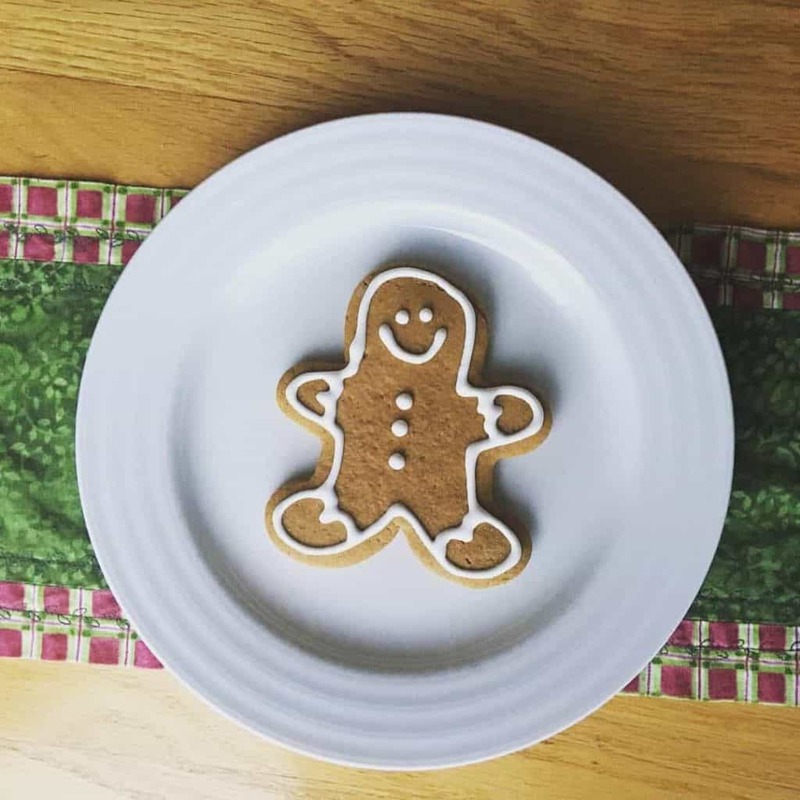 You will want to run as fast as you can to catch these allergy free gingerbread cookies! They’re dairy free, egg free, soy free, wheat/gluten free, peanut free, tree nut free, fish free, and shellfish free and are super fun to make and decorate. The kids each got to roll out gingerbread, cut out their very own “man” and put it in the oven to bake. I didn’t want my son to miss out on the fun so I tweaked the traditional recipe with some allergy free substitutes to make it dairy, egg, soy, and wheat/gluten free (traditional gingerbread doesn’t contain nuts or fish/shellfish). Ever since, we have made gingerbread men at Christmas time each year. We always have fun decorating them! To decorate, I start by frosting them with standard powdered sugar frosting. Then, it’s time to dress them up! We like to use cut up various candies to use as hair, eyes, nose, mouth, buttons, etc. Some of our favorites our Mike and Ikes (which work great as eyes and buttons) and Gummi Lifesavers (great smiles or hair), chocolate chips, marshmallows and the usual red and green sugar sprinkles. Use whatever is “safe” for you. Just remember not to take your eyes off of these little guys or they might just run away! These gingerbread cookies work really well for making cut out gingerbread cookies and are free of dairy, egg, soy, wheat/gluten, peanuts, tree nuts, fish, and shellfish. Preheat the oven to 350 degrees. In a small bowl, mix together the flax seed meal and 3 tablespoons warm water. Let stand for about 10 minutes. In a mixing bowl, combine the sugar, molasses, oil and water. Add the flax seed and water mixture. In a separate bowl, combine the flour, baking soda, salt, cinnamon and ginger. Add the dry mixture gradually to the wet mixture and mix well. Roll the dough into a ball, cover the mixing bowl and refrigerate the dough for at least 1 hour. Roll out the dough to 1/4 inch thickness on a floured surface (I use rice flour). Using cookie cutters cut into desired shapes. Place cookies onto an ungreased baking sheets. Bake for 9-10 minutes in a preheated oven or until cookies are firm. what can we use instead of molasses? I haven’t tried a substitute for the molasses in this recipe so I can’t say for sure. You could try brown sugar (which contains molasses so if you need to avoid molasses for health reasons this wouldn’t be a good option). Dark corn syrup is another option that also contains molasses. Maple syrup might work but I think I would reduce the amount the recipe calls for (maybe 1/4 cup instead of 1/3?) With maple syrup, the cookie will have a different flavor. Again, I haven’t tested it so I’m not sure how these substitutes will change the texture of the dough and the ability to roll it out for cut outs. If I get some time this week I just might try it! Please let me know if you try it and how they turn out! Sounds good, Victoria! Hope it works out!